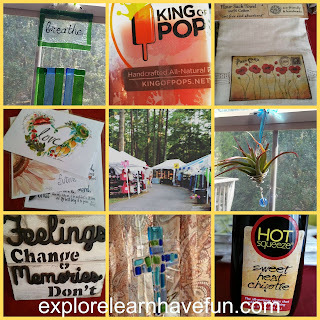 Some of the treasures we found at the Yellow Daisy Festival! David and I spent two mornings at the 48th annual Yellow Daisy Festival at Stone Mountain Park this week and wow - the vendors this year are amazing!! There are still two more days for you to attend, so make plans to go while I tell you a little more about it. First of all - plan on lots of walking - we managed almost 5 miles between our two mornings there. Good walking shoes are a must. And take a frozen water bottle because you will need it! We went at 10 am yesterday, and it was already hot and pretty crowded. Today we got there at 8 am, paid $5 for early bird admission and that made a huge difference. So much cooler and the crowd level was 1 out of 10! (Yesterday was more like an 8/10!) After experiencing both early and regular admission at this year's Festival, I think it is worth the fee to get in early. With over 400 artists and vendors there, you can find almost anything! 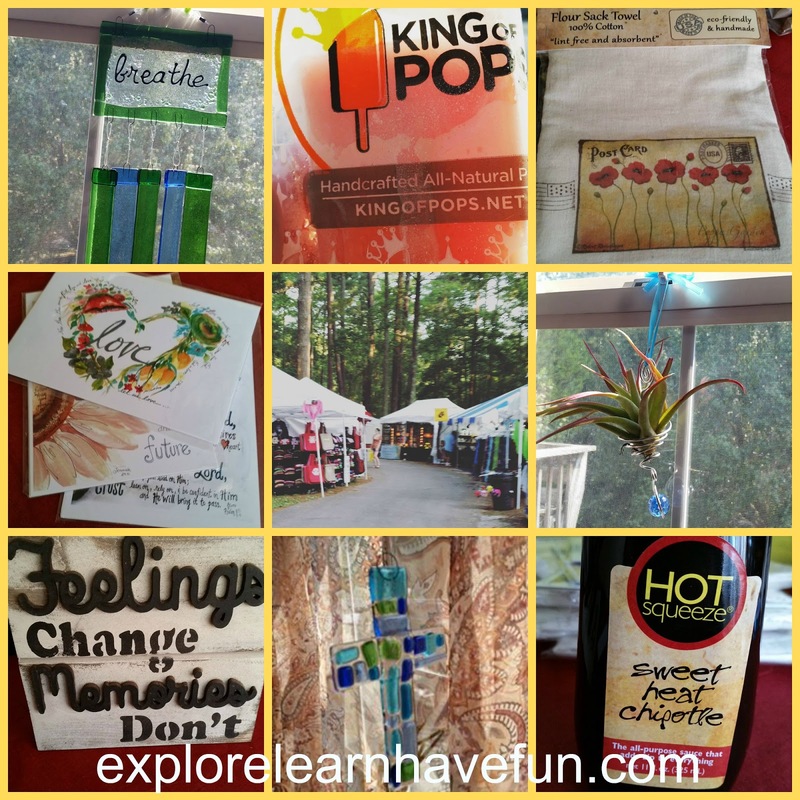 We saw stained glass, windchimes, birdhouses, maple cutting boards, hot sauces, clothes for kids and women, leather goods, kitchen decor, musicians selling their music, plants, body and facial care products, yard decor, Christmas ornaments and decor, quilted goods, purses, artwork, bow and arrow sets, musical instruments, and so much more! I was able to knock out quite a few of my Christmas gifts there. There are food trucks and vendors galore, and lots of places to sit and rest for a bit out of the sun. You'll even find a Man Cave-type place for the men to wait on their wives, and a Children's Corner with fun kids activities! We got delicious popsicles from King of Pops both days. Yesterday David got their Sweet Tea & Lemonade Pop. Today he got that one again, and I tried the Salted Watermelon Pop. Highly recommend them both! Parking is $15 per day, or an annual parking pass is $40. Festival Admission is free during regular hours with your parking fee. If you go early, it's $5 for per person, over age 12. Visit Stone Mountain's website for more information! If you go, I'd love to hear what you think of this year's festival - leave a comment below! We went to Stone Mountain Park many nay years ago and really liked it. It wasnt daisy time though. It is certainly beautiful any time of year!